New York (September 23, 2014) – The New York City Department of Transportation’s Summer Streets 2014 arts festival once again turned Manhattan’s Park Avenue pedestrian tunnel into an immersive art experience with help from WorldStage, which provided audio and lighting support for Norwegian artist’s Jana Winderen’s sound installation, “Dive.” Last year WorldStage teamed with NYCDOT and artist Rafael Lozano-Hemmer on “Voice Tunnel,” the first time in history that an artist transformed the utilitarian space on Park Avenue between 33rd and 40th Street. Jana Winderen has worked as an artist, curator and producer since 1993. She has researched the hidden depths of the world using the latest technology to reveal the complexity and strangeness of the unseen world beneath. She focuses on finding and revealing sounds from otherwise inaudible natural habitats and creatures. The subterranean tunnel was a perfect venue for “Dive,” which featured sounds of crustaceans, fish and mammals recorded by Winderen in shallow to deep underwater environments from Greenland to Thailand and beyond. Those sounds mixed with lapping waves and man-made noises from boats and seal-scaring devices. 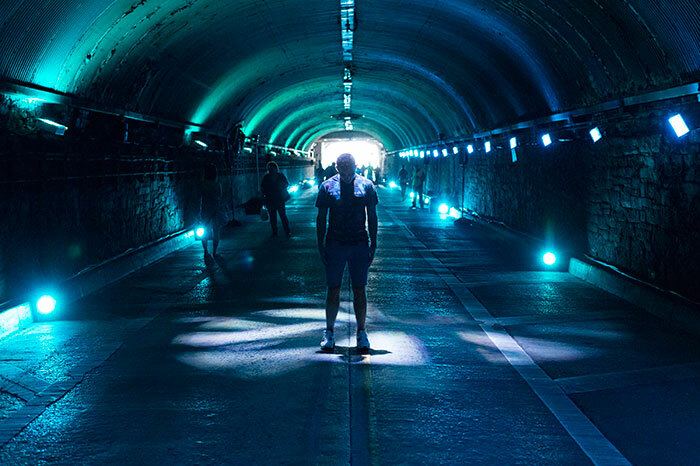 The public explored eight habitats of sound diving deeper and deeper into the tunnel, which was bathed in evocative blue light. WorldStage provided 64 Meyer UPM-1P Compact Loudspeakers, 16 Meyer 500-HP Compact High Power Subwoofers and RedNet PCIe cards in external Thunderbolt Chassis for the signal audio control installation. WorldStage audio system designer Kate Brown once again integrated the sound system working with Winderen and Professor Tony Myatt, who designed and programmed the audio system to play in 3D spatial sound. Lighting also played a key role in creating the tunnel’s underwater atmosphere. Fixtures consisted of 100 Color Kinetics Color Blasts and 100 Astera wireless LED PARs, which supplemented 30 high-output LED fixtures provided by NYCDOT and the 12 high-output sodium fixtures – the regular tunnel lighting – that were gelled to match the WorldStage units. At WorldStage Dennis Menard was senior project manager, Daryl Carmen production manager, Michael Kacunel audio A1, Alison May lighting director/programmer and Erik Perry senior project manager/lighting. IATSE Local One provided the crew labor.